One of Washington, DC’s most highly publicized condo projects in recent years is The Woodley-Wardman—melding restored classic row houses with a new seven-story building that sits directly behind them. Offering a blend of history, luxury and modern design, the complex was delivered in 2011 and won “The Best Boutique Condominium in the Mid-Atlantic” award that year, from Delta Associates. 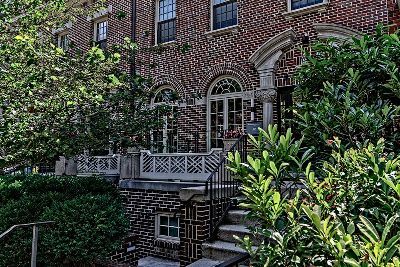 The Woodley-Wardman is located at 2818 Connecticut Avenue NW in the Woodley Park neighborhood. The zip code is 20008. The genesis for the development was four historic Harry Wardman Victorian row houses. The builders restored these first, before moving on to what is referred to as “the tower” behind them—although it is really more of a rectangular building. The tower was designed in a joint effort by noted architects Carina Lagrotteria and Christian Zapatka. In total, there are 39 different units, with an astounding 33 unique floor plans. So what kind of condos for sale can one expect to see at The Woodley-Wardman? Before you get too excited, most of them sold right away. Still, units do come on the market now and then. The various residences are comprised of studios, one, two and three-bedroom models, plus four Tower Penthouses. List prices have ranged from $300,000 to $2.1 million. Inside, you’ll find choices of maple or oak wide-plank flooring, with sunny open spaces and chef kitchens featuring quartz counters and marble backsplashes. Appliance choices include Bosch, SubZero, JenAir and Fisher Paykel. Some units are flats, and other are townhouse style with floating staircases. There are also balconies and rooftop terraces, along with iPod docking stations and many other design touches. There is even concierge service—a rarity for a boutique condominium—plus two years free parking. This historic neighborhood is right by the Smithsonian National Zoo, and a block away from the Woodley Park-Zoo/Adams Morgan Metro at Connecticut NW and 24th Street. The park itself provides a welcome respite for local residents. As for drinks and dinner there’s Stone’s Throw Restaurant & Bar, Lebanese Taverna, New Heights Restaurant, Petite Plats and many more. In other words, you get the best of everything here—history, modernity, style, convenience and plenty of green space as well.